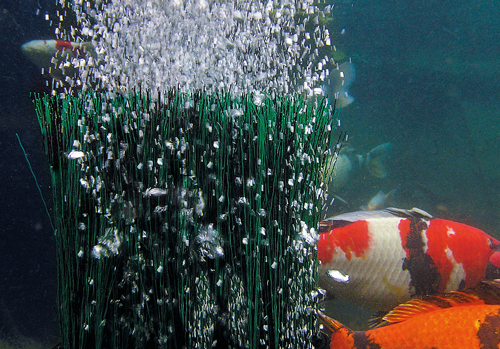 Pond Aerators add vital oxygen and assist in circulating water in ponds and lakes. Air Pumps also help during winter months to keep an area ice free. Oxygen is crucial in a fish stocked pond but will also help to break down nutrients within the pond, thus playing an important role in biological regeneration. Introducing air into the pond by means of a pond aerator is an effective way of increasing the dissolved oxygen content. Air pumps will force ambient air down small silicon hoses, through porous air stones where the rising columns of air bubbles will diffuse oxygen into the water as they rise to the surface. Summer is the most crucial time for aeration as the warmer water cannot support as much oxygen as cooler water would. In the winter, the rising bubbles will keep and area of the pond free of ice, allowing toxic gases to exchange at the surface.